Meal makers: Add a few simple sides to this one-pot meal and double the fun and the food on the table! Prepare store-bought egg or spring rolls (preferred brand Pagoda Cafe) with dishes of duck sauce and sweet hot mustard for dipping. Chill pieces of sliced melons and pineapple spears for a simple dessert. Fortune cookies and green tea are readily available in the Asian food aisle at the market and will add to the total effect of a weeknight fun Chinese supper for your family. 1. Heat a wok-shaped skillet or large non-stick skillet over high heat. When pan is very hot, add oil, (it will smoke a bit) then, immediately add the snow peas, pepper, mushrooms, scallions, and bean sprouts. Stir fry for 1 minute to flavor the oil, then add the ginger and garlic, and stir-fry 2 minutes. Add the cooked noodles and toss with to combine. Add the soy sauce and toss the ingredients to coat noodles evenly with sauce. 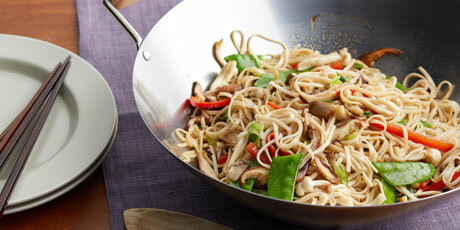 Transfer the lo mein to a serving platter and garnish with a drizzle of toasted sesame oil.